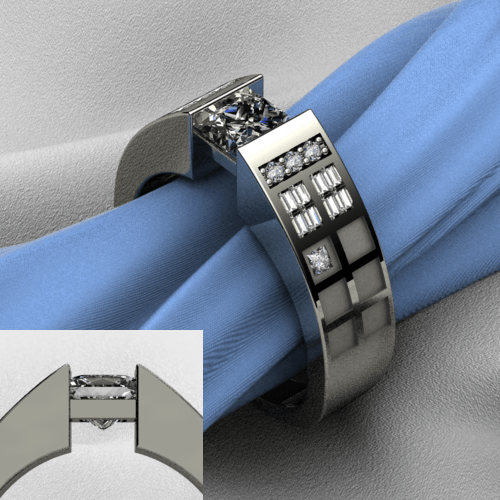 Gino Arizmendi made this TARDIS-inspired wedding ring and it’s been making the rounds over the last week. To get the ring exactly like the picture, cast in 14K gold and with a 1CT Princess Cut Diamond G-HSI1 quality. The ring is set with 30 points in diamonds, 16 baguettes, and 6 rounds for a total diamond weight of 1.30ct. The cost is $9950. I can also make this ring in Sterling Silver and set with Cubic Zirconium for $380. Gino’s also working on a similar men’s design. Interested in ordering your own? Email him at ginoarizmendi@artgemsjewelers.com. That is absolutely gorgeous and incredible. Hi Kath! Just email Gino: ginoarizmendi@artgemsjewelers.com and he can get you all set up!